2) Maharajah Jungle Trek – Guests who enjoy time in Disney’s Animal Kingdom might definitely encounter heavy crowds thanks to the very popular Pandora – The World of Avatar and beloved attractions such as Expedition Everest and Dinosaur. Guests who are looking to escape the crowds on a busy day in the park can head over to the Asia area just past the entrance to Kali River Rapids to enjoy a self-guided walking tour on a beautiful path. The Maharajah Jungle Trek brings guests into the Anandapur Royal Forest which were once the hunting grounds of wealthy local maharajahs. The beautiful path allows guests to wander at their own pace and observe amazing animals such as Blackbuck, Water Buffalo, Gibbons, and a Komodo Dragon. Gusts can also wander through a beautiful aviary where over fifty species of birds can be found swopping and gliding above. The most popular portion of the Maharajah Jungle Trek comes when guests stumble upon ancient temple ruins which are now home to beautiful Asian Tigers who can be found frolicking in fountains and grassy areas. 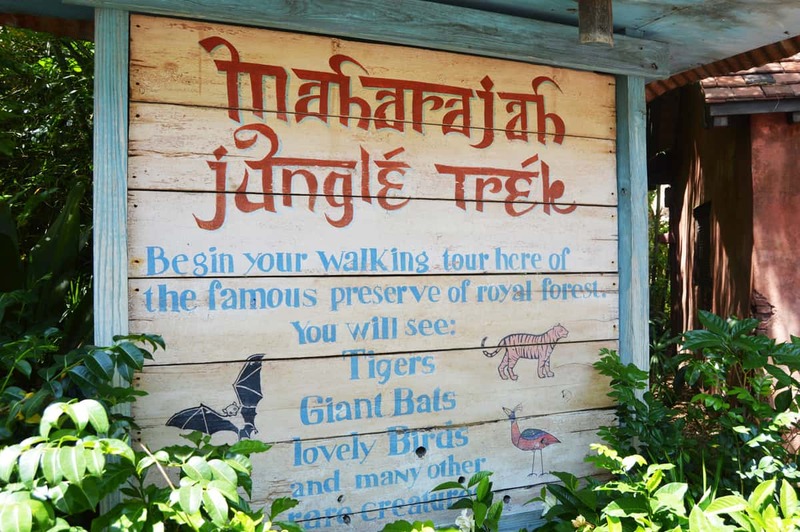 The Maharajah Jungle Trek is a great experience on any day in Disney’s Animal Kingdom and also a wonderful way to avoid the crowds.